The objective of this project is to reconstruct the processes that are at the root of the growing environmental awareness in Japan, from the point of its inculcation in the 1990s to the present day. The project rests on two pillars: 1) the exploration of popular attitudes towards environment, recycling, and energy conservation that are in continuous conflict with high expectation in relation to comfort and convenience of life; and 2) the study of cultural articulation of the consumer culture and the newly emerging environmental consciousness in visual arts. On the one hand, we will examine mundane practices such as the rise of ‘convenience stores’ and other environmental unfriendly practices. On the other hand, we will study a selection of works by the artists born in the late 1960s and 1970s, such as Hiroshi Fuji (1960-) and Manabu Ikeda (1973-), in an attempt to uncover the role played by environmental consciousness in their work. The eco-art movement – the processes of artistic recycling transforming garbage into art – is particularly conspicuous in this respect. 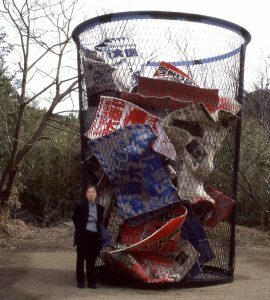 For example, Yodogawa-Technique, an art unit founded by Hideaki Shibata (1976-) and Kazuya Matsunaga (1977-), create objects using garbage and items drifted to the riverbank. In his large-scale installation constructed from 100.000 discarded toys (‘Central Kaeru Station – Where Have All These Toys Come from?’, 2012) Fuji comments on the disposable nature of contemporary toys and consumerist appetites of younger generations. The works by these and other artists, who have achieved their artistic maturity around the time of the fall of the Berlin Wall, reveal high sensitivity to the environmental problems and stand in sharp contrast with the popular image of intellectual and social flatness of contemporary art in Japan driven by the global consumerist agenda.